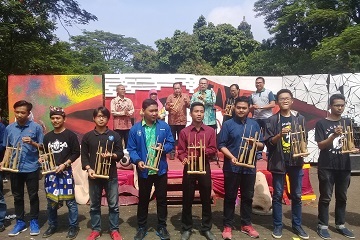 Bogor Agricultural University (IPB) again organized IPB Art Contest (IAC), a great art show in IPB. The aimed to organize such event is to inspire the creativity of IPB students. The event is organized by Student Executive Board (BEM) of Student Association of IPB. IAC is attractively repackaged with the concept of a faculty parade. Rector of IPB, Dr. Arif Satria, SP. M.Si had the opportunity to open IAC in Gladiator, IPB Campus, Dramaga, on Saturday, 10 March 2018. Latent talents in students, in the future they are expected to support creative industries and explore the culture of Indonesia with the talents owned by students. "This is important, because the Indonesian government has made the creative industries a priority in its new industrial strategy. Creative industries such as the arts, film, design, media and publishing need a continuous stream of fresh ideas and talent. There is a saying that resources are limited but creativity is unlimited. So this is a place to arouse our creativity. If the creativities of students are developed they might build another world, "said Rector of IPB in his speech. Rector added that Indonesia has a particularly rich tradition. Artwork of Indonesia is ultimately diverse and rich from Sumatra to Papua, to an extent that its influence have reached Philippines, Brunei, Thailand and Malaysia. This is the time for young people to explore, it's time to inspire the world with Indonesian culture. "Therefore, the talents you possess have preserved our culture, the talents you possess can develop creativity for the creative industries or to balance the right and left brain. Another benefit that comes from preserving cultural heritage as a whole is the communal support," he added. Accompanying the rector for the IPB Art Contest opening were Vice Rector for Education and Student Affairs, Dr. Ir. Drajat Martianto, and several the officials of the Faculty, such the Dean of the Faculty of Mathematics and Natural Sciences (FMIPA), Ir. Sri Nurdiati, M.Sc; the Director of General Competence Education Program (PPKU), Prof. Dr. Toni Bakhtiar, S.Si., M.Sc. ; the Director of Vocational School, Dr. Ir. Bagus Priyo Purwanto, M.Agr. ; the Dean of the Faculty of Forestry. Ir. Rinekso Soekmadi, M.Sc.F.Trop. ; and Chairman of BEM IPB, Qudsyi Ainul Fawaid.